Steam open the mussels. Put them in a deep pan with the water. Cover the pan and put over a high heat, shaking the pan, until the shells open. Remove from heat and discard any mussels that do not open. Mussels can also be opened in a microwave. Place them in a microwave-safe bowl, partially covered, and microwave at full power for one minute. Stir and microwave one minute more. Remove any mussels that have opened and microwave one minute more. Again remove open ones. Repeat twice more. Discard any mussels that have not opened. When cool enough to handle, remove and discard the empty shells. (Mussels can be cooked in advance and refrigerated.) 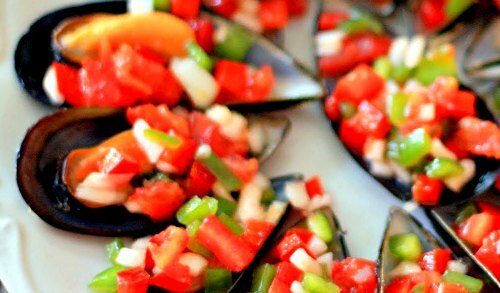 Shortly before serving, arrange mussels on a bed of shredded lettuce on a serving platter. In a bowl combine the onion, green and red pepper, parsley, oil, and vinegar. Season with red pepper sauce and salt. Spoon the mixture into the mussels in their shells.